Almost everyone who has ever dieted knows how hard it is to keep the weight off. And almost everyone, including many scientists, has wondered what works. In recent news, a California judge ruled that Kaiser Foundation cannot routinely deny coverage for skin excess procedures by classifying them as cosmetic in nature. The class action lawsuit, started by Wendy Gallimore of Alameda County in 2012, argued that Kaiser violated California law by refusing to cover procedures designed to remove excessive skin after surgical weight loss. The lawsuit and updates are in the Kaiser Plastic Surgery Class Action Lawsuit (Updated) article. Previous studies comparing early laparoscopic cholecystectomy (ELC) with delayed laparoscopic cholecystectomy (DLC) for acute cholecystitis were incomplete. A meta‐analysis was undertaken to compare the cost‐ effectiveness, quality of life, safety and effectiveness of ELC versus DLC. Wabitsch et al. (Jan. 1 issue) 1 highlight how biologically inactive leptin from a mutation in the leptin gene (p.D100Y) led to early-onset extreme obesity in a 2-year-old boy, a finding that paralleled a murine model encoding mutated leptin (p.V145E). The authors cite studies that characterize leptin as an adipocyte-derived hormone reflecting body energy status and functioning as a satiety signal in the hypothalamus. Hence, the mechanism of obesity is ascribed purely to that resulting from hyperphagia and consequently high energy intake. Importance Accumulating evidence suggests that bariatric surgery improves survival among patients with severe obesity, but research among veterans has shown no evidence of benefit. Objective To examine long-term survival in a large multisite cohort of patients who underwent bariatric surgery compared with matched control patients. 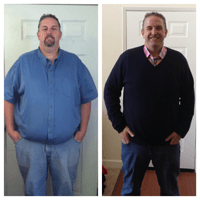 “I’ve struggled with weight my whole life,” says Morgan Hill resident Matt Reichstein, 45, who had weight loss surgery at with Dr. Zare. Weight 434 lbs. 265 lbs. At 6’3″, Matt has always been a big, active guy. He grew up in the Santa Cruz Mountains, where kids often teased him about being fat. Throughout his time at Los Gatos High School, he was a three sport athlete. It was during his college years that Matt really started putting on the weight. By the time he was in his 20s, he was in the 400-lb. range. Food has always been important to Matt. In his mid-30s he started putting the weight back on. “It was as though food consumed me, and it felt like I never had enough. Plus, as I got older, it was harder to take off the weight in the gym,” he recalls. At times, he would ‘give up’ his life again, redoubling his exercise efforts and trying to keep his diet in check—only to put it all back on and more. By the time he was in his early 40s, Matt was tipping the scales at 460 or 470 lbs. Life changed the day he was approached by an old acquaintance during a night out with friends. “I recognized her eyes, but not the rest of her. She looked great,” said Matt. Turns out they had known each other for a long time and had a few things in common. She, too, was a good athlete and an active person but had always battled her weight. When Matt asked her what she had done to look so good, she told him about having weight loss surgery and urged him to consider it. Over the next few months, he learned as much as he could about the surgery and his options. He met with a weight loss surgery nurse, attended support group meetings, and was referred to Dr. Zare, a surgeon on the medical staff at Good Samaritan Hospital. It was time for a change. Matt and his surgeon selected a procedure called the laparoscopic vertical sleeve gastrectomy. With this minimally invasive surgery, a narrow sleeve of stomach is created and the excess stomach is removed. The procedure limits the amount of food a person can eat and helps suppress appetite. Patients can lose more than 75 percent of their excess weight over a period of eight to eighteen months. After going through the weight loss surgery programwith Dr. Zare, and completing the necessary tests and preparations, Matt had his procedure. His parents and brother were with him. Friends and family were very supportive throughout his brief time in the hospital and for a two-week stay at his parents’ house after his discharge. Matt continued his walks and returned to the gym for light workouts a week after surgery. He was able to go back to work in just two weeks. For him, the hardest thing was the all-liquid diet he had to follow for two months. Within 4-6 weeks, he began doing heavier workouts at a new gym called Fitness Never Sleeps. According to Matt, the weight began ‘pouring off,’ with 50 lbs. vanishing in the first three months. “That gym and the people there have become my support group. Working out has taken the place of much of the eating that used to be such a big part of my life,” he reports. Matt won’t lie. Going through the changes in his body and adjusting to a much smaller diet have not been easy. Clinical outcomes after many complex surgical procedures vary widely across hospitals and surgeons. Although it has been assumed that the proficiency of the operating surgeon is an important factor underlying such variation, empirical data are lacking on the relationships between technical skill and postoperative outcomes. We conducted a study involving 20 bariatric surgeons in Michigan who participated in a statewide collaborative improvement program. Each surgeon submitted a single representative videotape of himself or herself performing a laparoscopic gastric bypass. Each videotape was rated in various domains of technical skill on a scale of 1 to 5 (with higher scores indicating more advanced skill) by at least 10 peer surgeons who were unaware of the identity of the operating surgeon. We then assessed relationships between these skill ratings and risk-adjusted complication rates, using data from a prospective, externally audited, clinical-outcomes registry involving 10,343 patients. Mean summary ratings of technical skill ranged from 2.6 to 4.8 across the 20 surgeons. The bottom quartile of surgical skill, as compared with the top quartile, was associated with higher complication rates (14.5% vs. 5.2%, P < 0.001) and higher mortality (0.26% vs. 0.05%, P=0.01). The lowest quartile of skill was also associated with longer operations (137 minutes vs. 98 minutes, P < 0.001) and higher rates of reoperation (3.4% vs. 1.6%, P=0.01) and readmission (6.3% vs. 2.7%) (P < 0.001). The technical skill of practicing bariatric surgeons varied widely, and greater skill was associated with fewer postoperative complications and lower rates of reoperation, readmission, and visits to the emergency department. Although these findings are preliminary, they suggest that peer rating of operative skill may be an effective strategy for assessing a surgeon’s proficiency. Weight-loss surgery changes the levels of genes involved in burning and storing fat, a new study says. The findings may help lead to the development of new drugs that mimic this weight-loss-associated control of gene regulation, said the authors of the study published online April 11 in the journal Cell Reports. San Jose, Campbell, Los Gatos, Cupertino, Santa Clara, Los Altos, Mountain View, Morgan Hill, Gilroy, Santa Cruz, Scotts Valley, Ben Lomond, Saratoga, Monte Sereno, Holy City, Redwood Estates, New Almaden, Sunnyvale, Coyote, Milpitas, Alviso, Felton, Boulder Creek, Brookdale, Mount Hamilton, Soquel, Palo Alto, Mount Hermon, Aptos, Stanford, Portola Valley, Fremont, La Honda, Capitola, Newark, Menlo Park, Atherton, San Martin, Davenport, Sunol, Redwood City, Pescadero, Freedom, Livermore, San Gregorio, Watsonville, Union City, San Carlos, Belmont, Hayward, Pleasanton, San Mateo , Sacramento, Kennedy, Salinas, Stockton, Modesto, San Francisco, Oakland, Lexington Hills, Los Altos Hills, Loyola, Alum Rock, Antioch, Concord, Berkeley, Monterey, Vallejo, Napa, Davis, Santa Rosa, Angels Camp, Citrus Heights, Daly City, Fresno, East Palo Alto, Sausalito, Half Moon Bay, Burlingame, Walnut Creek, Pleasant Hill, Alameda, Pacific Grove, Millbrae, Emeryville, San Bruno, Albany, Pacifica, Brentwood, Moss Landing, Foster City, San Ramon, Dublin, Castro Valley, Lafayette, Tiburon, Richmond, Seaside, El Cerrito, Marina, El Granada, Danville, San Leandro, Brisbane, San Juan Bautista, Hollister, Moss Beach, Pittsburg, Orinda, Pacheco, Kensington, Moraga, Castroville, Belvedere, Piedmont, Tracy, Alamo, Clayton, San Pablo, Woodside, El Sobrante, Manteca, Gustine, Montara, Loma Mar, Westley, Byron, Oakley, Aromas, Prunedale.